which will, in turn, drive enterprise, create jobs and deliver sustainable economic growth. 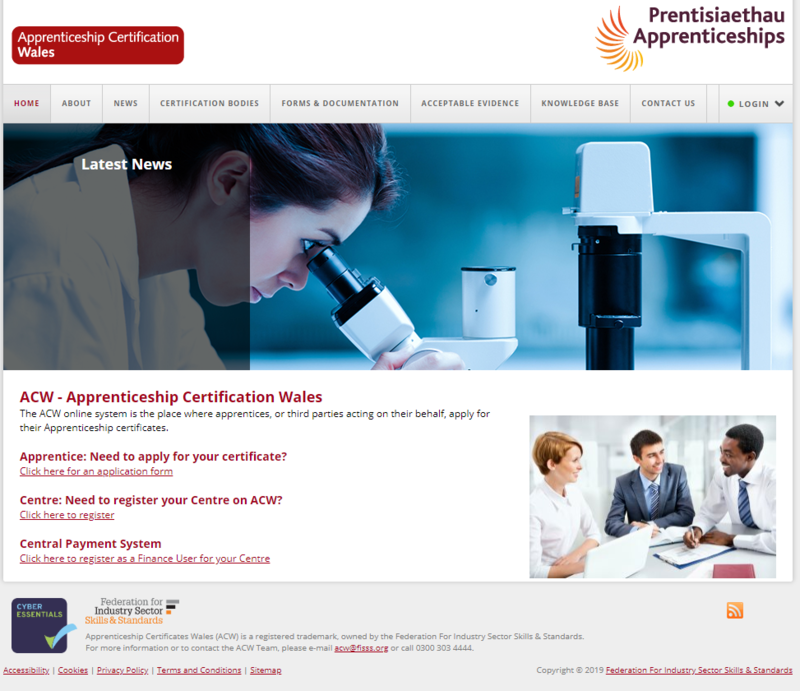 apprentices to request Apprenticeship completion certificates. • Receive requests for certificates from learning providers, employers or apprentices. framework requirements have been met. facilitate apprentices applying directly for their own completion certificates. of the Apprenticeship framework have been completed. You can locate the form on the home page of the ACW home page: http://www.acwcerts.co.uk/. 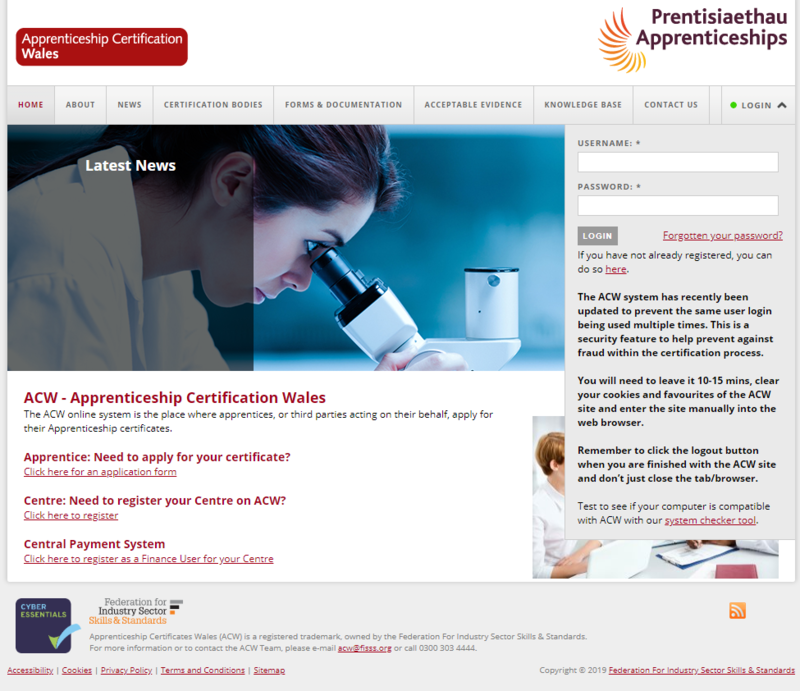 When the form has been completed it will need to be uploaded to the Apprenticeship Certification Wales (ACW) system. Centres select all of the SSCs/SSBs (known as Certification Bodies) they need to work with and once the registration form is submitted, the ACW access request is sent to the Administrator at each of the selected Certification Bodies. ACW Administrators at each of the relevant Certification Bodies register the Centre and create an Administrator account and password which is then sent to the e-mail address provided on the submitted ACW access request form. Certification bodies also assign Centres the necessary access to the required frameworks. Centre Administrators can now access ACW and can create additional user accounts within their organisation. They can now use ACW to input learner data and load the evidence required to claim an Apprenticeship completion certificate. • Click on the Login button. • Enter your Username and Password. • Click the Login button to enter. • Please refer to the system checker to make sure your system meets the ACW system requirements. — Green ticks are confirmation your system is compatible. Should you have any problems logging in with your username and password, please contact the relevant Certification Body. Please be aware that the Username and Password are both case sensitive. Keep all passwords in a safe place and do not reveal them to anyone. 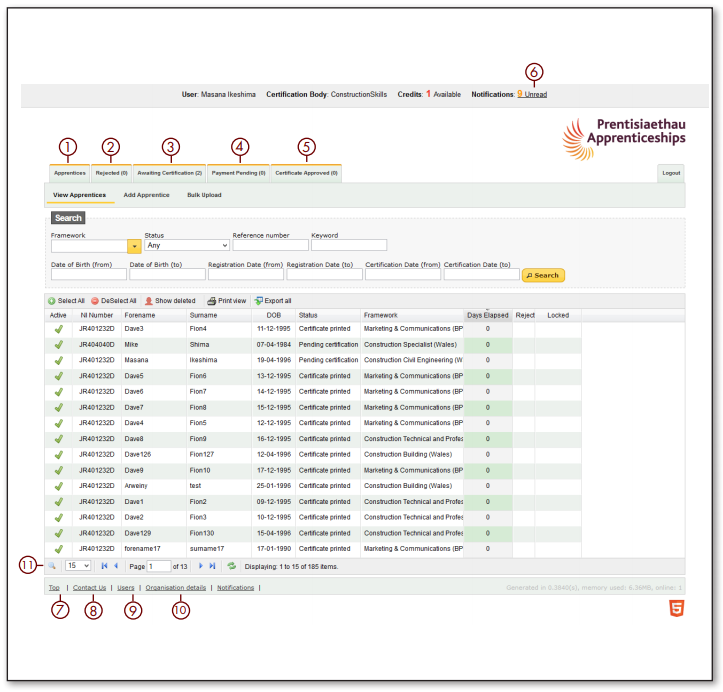 ACW follows the history of each Apprentice by tracking login details. If additional user accounts need to be added then the Admin User will be able to set up accounts for colleagues to access the system. If you are an Internet Explorer user please ensure you have the latest version.With IE there are some further versions with support but with this the users will have to enable it, IE 8,9,10 only on Windows 7 or later, however we would recommend using Google Chrome or Firefox instead. If you experience any issues accessing our application you may need to ask your IT Department to whitelist the website address http://acwcerts.co.uk/. For more information or to contact the ACW Support Team, please e-mail acw@fisss.org or call 0300 303 4444. What browser do you recommend using for the ACW System? Is there a minimum specification for computers that you recommend to get optimum performance from the ACW System? – No hard disk requirement. ACW is a web-based system that requires no software to be installed on your computer(s). Please note that ACW runs on PC and Mac, as well as on Linux. apprentices, search for and edit apprentice details. 2. Rejected – View and update apprentices for certification. certificates are still to be paid for (if applicable). been printed the apprentice will be removed from this folder. 7. Top – Takes you back to the top of the current screen. Sector Skills and Standards Managers of ACW. 9. Users – Allows users of ACW to be created. 10. Organisation Details – Check organisation details.